PITTSBURGH (AP) — Mike Tomlin’s heart was heavy when he went to work on Sunday morning. The Steelers coach wasn’t alone. All of Pittsburgh felt broken after 11 innocent people were killed in a shooting at a synagogue that Tomlin estimated is “800 yards” from his home. 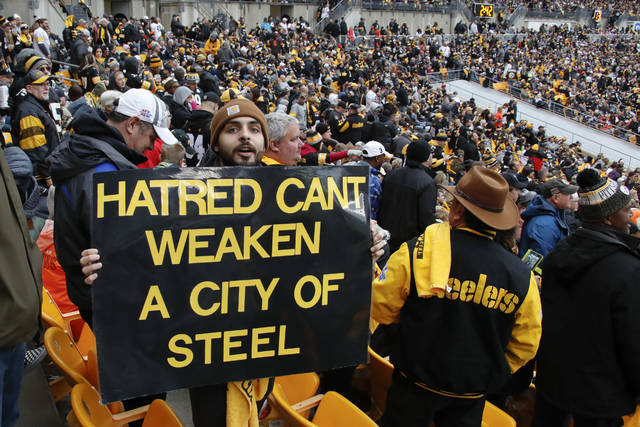 But true to its steely reputation, the city — and the Steelers — stayed strong. Tomlin had addressed his players about the shooting on Saturday night, hours after a gunman walked into the Tree of Life Synagogue during services and killed eight men and three women ranging in age from 54 to 97. The dead included Cecil and David Rosenthal, whose sister, Michele, is the Steelers’ former community relations director. “It was crazy tough and especially of Michele and the closeness that we have with her,” said Roethlisberger, who threw a pair of touchdown passes to Antonio Brown. “Coach always talked about when you step inside the white lines everything else has to kind of go away, but sometimes it’s easier said than done. I told the guys during the post-team prayer, we’re thankful for a victory, but we also understand there are bigger things, there is life. 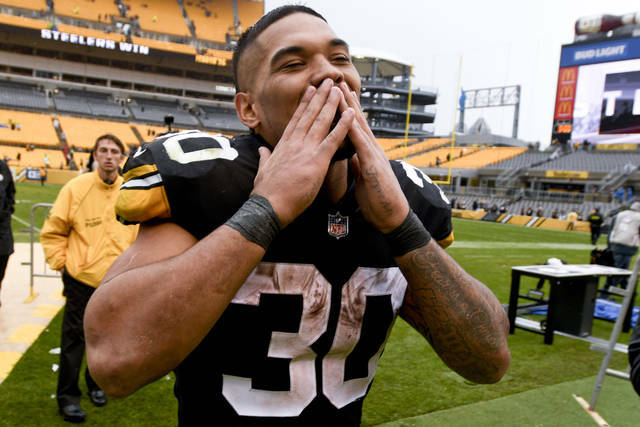 But with Conner making Le’Veon Bell’s messy contract holdout less impactful every game behind an offensive line backing up praise about Conner, the Steelers appear to be the class of the AFC North again. 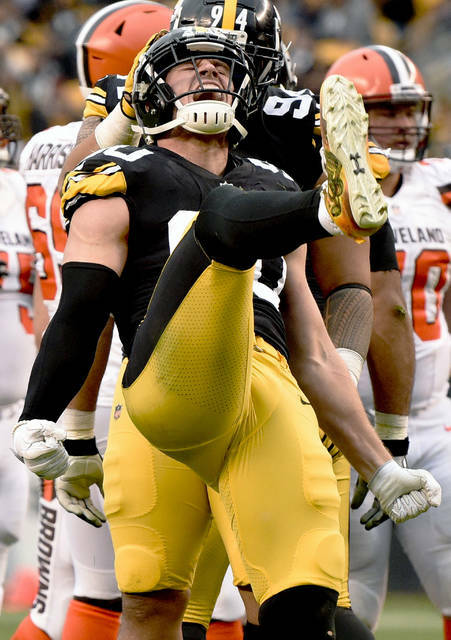 For Conner, who played college ball at Pitt and won his own battled with cancer, Sunday’s win went deeper than just being the 15th in a row at Heinz Field over the rival Browns. While Jackson’s days appear numbered, there are also rumblings about offensive coordinator Todd Haley’s future. Jackson caused an uproar last week following a loss at Tampa Bay when he pledged to “dive” in and help Cleveland’s struggling offense. Well, the Browns were still plagued by many of the same problems and Jackson continues to insist he and Haley are not at odds. Browns rookie quarterback Baker Mayfield won’t forget his introduction to the Steelers. Mayfield threw two touchdown passes — the second with 6 seconds left — and had some nice moments in his fifth career start. But he was under pressure all day, took some hard shots, and it seems as if the Browns aren’t doing enough to cater the offense to his strengths. Brown finished with six catches for 74 yards, just another day at the office for arguably the game’s best receiver. Brown has caught a TD pass in five straight games and he and Roethlisberger have connected on 67 career TDs, tying them with Peyton Manning and Reggie Wayne for the seventh most by a QB-WR tandem in league history.